I spent a few hours at the Calusa Nature Center today(pictures coming soon!). I was doing my usual brace-compose through viewfinder-focus-shooting when I met a very nice couple: Danny and Niva. Guess what? They too were Sony shooters. 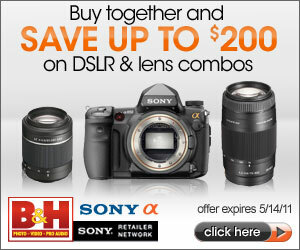 :) They had recently purchased the Sony Alpha A580 DSLR and had the kit 17-55mm lens on. However, because the wildlife at the Calusa Nature Center were all behind chain link and wire mesh fences, you really want something longer than 50mm to blur the fence into oblivion, so you can get a clean shot of the wildlife. After talking a bit, explaining that the 70-400 was a pretty good lens, and that I was able to rent it from BorrowedLenses.com, I decided to do a test: I took the 70-400 off of my A700, mounted it on their A580, and took some test shots. This was done partly because I really hate it when folks don't get shots they'd like to have. It was also done so that I could gauge the A580 as a camera, and by extension, the upcoming A77X as a camera. The camera is very very light. Compared to the A700, the A580 feels very light and plastic. Kinda like holding a Canon Rebel T2i. Not horrible, but you don't get that solid feel like you do from the A700/A850/A900. The grip was a decent size! I did not suffer from the dangling pinky syndrome. With a vertical grip, it would a fairly comfortable camera to use for extended periods of time. Using the back LCD as an EVF was rather nice. Mounting the 70-400/ssm on the A580, I held the camera up above my head to get a different composition and was able to compose with the nice 3" high resolution LCD. After spending the last couple of hours bending over and squinting into the eyepiece for every shot on the A700, this was a welcome relief. Danny and Niva were also able to see what I was shooting and focusing on right then and there! The 10fps firing rate on the camera is no joke! Even with mirror, it had a very clean sound. I'm guessing it is sharing the same shutter as the A55, as they sound very much alike. I did not use the OVF on the A580. I also did not use the A580's eyepiece EVF. The point was to test the use of the back LCD EVF as well as the handling. I have to say, I like it. If the A77X can combine the best of the new generation of Sony technology with A700/A850/A900 handling/ergonomics, I will be a VERY happy camper. High resolution, low latency, back LCD EVF. Optical view finder eyepiece would be nice, but chances are, it's an EVF. Please let it be a high resolution OLED with low latency? 10fps with buffer and dump to card speeds enough to allow for a deep queue. UDMA CF card support for 80MB+ cards! NORMAL USB port! Make tethering and card reading easier! Electronic shutter sync for higher flash sync speeds? Properly working FLASH sync/triggering without flash popup! HD video recording without the weird 10-20minute limit. SLT with Mirror Lock Up mode!!!! I'm still concerned about things like SDXC/SDHC UHS-I and perhaps lacking CF... but at the end of the day, it's about producing photographs. And I really want the A77X to be a great tool to produce photographs with. After handling the A580, I'm a bit more hopeful for the A7X.